Expanded legalization increases the accessibility and risk for individuals vulnerable to pathological gambling. 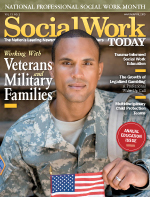 Social workers must be prepared to recognize symptoms and make treatment referrals. Most people can safely enjoy playing the lottery once in a while, taking the occasional trip to a casino, or participating in a poker game from time to time. For them, gambling is a fun, recreational activity. But it’s not that way for everyone. For millions of Americans, the urge to gamble becomes so strong that it leads to disastrous consequences, such as financial ruin, broken marriages, run-ins with the law, depression, anxiety, and even suicide. Gambling and its associated problems have been around for a long time. However, what is new is the recent increased opportunities to gamble as cash-strapped states desperate for new revenue streams relax prohibitions against slot machines, table games, and other forms of gambling. As states open the floodgates to gambling, there is a growing concern that behavioral health professionals, including social workers, are not adequately prepared to respond to the potentially harmful impact on communities. The National Council on Problem Gambling estimates that 1% of American adults can be classified as pathological gamblers based on current DSM criteria, and another 2% to 3% can be considered problem gamblers. Those numbers may seem small, but in a nation with approximately 240 million adults, that means between 7 million and 10 million American adults struggle to keep their gambling in check. For most of the 20th century, legalized gambling was almost exclusively associated with Las Vegas. However, that began to change in the 1960s when New Hampshire, seeking to raise funds for education without hiking taxes, became the first state to launch a modern government-run lottery. Other states took notice and soon introduced their own lotteries, and restrictions against casinos, off-track betting, horse racing, and slots faded away. Today, Hawaii and Utah are the only states that outlaw all forms of gambling. In this mad scramble among the states, some have emerged as gambling powerhouses. For example, Pennsylvania introduced its lottery in 1972 and joined the multistate Powerball lottery in 2002. During the past decade, trying to stem the tide of residents traveling to New Jersey to gamble in Atlantic City and facing a clamor for property tax relief, Pennsylvania also legalized slot parlors and table games. Last year, the state overtook Atlantic City as the second-largest market for casino gambling in the nation, behind Nevada. Between 2006 and 2012, annual gross revenue from slots and table games in Pennsylvania grew from $32 million to $3.2 billion. • A study of casino proximity in the Canadian province of Quebec found that people living closer to a casino were more likely to participate in gambling and spend more money at the casino. A separate study that focused on Montreal identified a positive link between proximity and gambling participation but not gambling expenditures. Neither study found a positive link between proximity and the rate of probable pathological or problem gambling (Sevigny, Ladouceur, Jacques, & Cantinotti, 2008). • Another Canadian study of gamblers in Ontario found that problem gambling was associated with several demographic and behavioral characteristics, including being male, reporting poor health, or having co-occurring substance abuse problems, and proximity to gambling venues was marginally important in predicting risk of problem gambling (Rush, Veldhuizen, & Adlaf, 2007). • Boardman and Perry (2007) examined bankruptcy rates in Kentucky counties within 25 miles of horse track and casino facilities. The researchers reported that close proximity to horse track facilities increased bankruptcy rates by 9.3%, but proximity to casinos did not have a significant impact on bankruptcy rates. • Focus groups and interviews with 38 gamblers in Australia revealed that there are several forms of accessibility to gambling, including geographic, temporal, and social accessibility. Problem gamblers in particular preferred venues that were near home or work, open long hours, and provided an accessible retreat from life issues (Thomas, Bates, Moore, Kyrios, Meredyth, & Jessop, 2011). The debate over prevalence rates often fails to capture the experiences of people who might not meet the criteria for pathological or problem gambling but struggle with how gambling interferes with their lives, says Mark Vander Linden, MSW, president of the Association of Problem Gambling Service Administrators (APGSA) and program manager for the Iowa Department of Public Health Office of Problem Gambling Treatment and Prevention. “There are people who fly under the radar but still have an impact on our communities,” he says. In addition, the expansion of legal gambling may affect groups that are not traditionally associated with gambling. For instance, data from the National Gambling Impact Study Commission show that adolescents who perceived that their peers and families supported gambling were more likely to gamble themselves, says Anthony Hill, PhD, LICSW, ACSW, an assistant clinical professor at the National Catholic School of Social Service at the Catholic University of America in Washington, DC. Recognizing that greater availability of legalized gambling opportunities could increase the number of problem gamblers, or at least increase demand for services, most states have allocated funds for problem gambling treatment, education, and prevention. Thirty-seven states provided a total of $58.4 million in funding for services in 2010, according to an APGSA report (Marotta, Moore, & Christensen, 2011). There are vast differences in the problem gambling services states provide, Vander Linden says. The most common services include state-funded treatment programs, toll-free helplines, public awareness campaigns, and training for social workers and other mental health professionals. States also vary widely on how much funding they provide for services. According to the APGSA report, per capita spending on such services ranged from less than a penny in Maryland to $1.36 in Iowa. Compounding the problem is that there is no federal agency tasked with coordinating problem gambling efforts, and any sort of federal funding for these efforts is rare and sometimes nonexistent. That results in an uncoordinated response among states, each with their own ideas about what services should be offered and how they should be funded, Nower says. Despite these challenges, some state-funded programs are finding success in their efforts to combat problem gambling. The Problem Gamblers Help Network of West Virginia was established a decade ago when the state decided to legalize slot machines. In that time, the network has taken about 15,000 calls from people seeking help for problem gambling, says Patty Deutsch, MA, LPC, the network’s director. Callers identified as problem gamblers are offered the option of receiving information about topics such as financial management and Gamblers Anonymous meetings as well as access to state-funded assessment and treatment services. Other services offered by the network include an annual retreat weekend where problem gamblers and their families can access training and counseling sessions, and connect with others who share their addiction. The network also engages in public awareness campaigns and trains mental health professionals. When a horse racing track in Dauphin County, PA, expanded to include slot machines and table games, officials in the county’s Department of Drug and Alcohol Services knew they needed to act. In 2012, the department used state funding to launch a multipronged effort to raise community awareness of problem gambling. The department developed a prevention curriculum aimed at middle school students, held town hall meetings, hosted training events for social services providers, and organized a “Give Back Day” where citizens participated in a flea market-type event and received information about problem gambling. Faced with continuing budget struggles, states’ reliance on legalized gambling is poised to keep growing. Not only will the number of land-based casinos continue to increase, but more and more states will explore the possibility of legalizing online gambling, Vander Linden says. The policy shift toward legalized gambling presents an unprecedented opportunity to raise awareness of problem gambling and get those affected the help they need. It’s an opportunity social workers can seize by becoming more informed about problem gambling, raising public awareness, and advocating for additional resources for prevention, education, and treatment programs, Nower says. Perhaps most importantly, she adds, social workers can make a concerted effort to incorporate questions about problem gambling into screening and assessment. Pathological gambling first appeared in the DSM-III in 1980 and is classified in the DSM-IV as an impulse control disorder. The classification measures the severity of a person’s gambling disorder based on how many of 10 symptoms the individual exhibits. Symptoms include being preoccupied with gambling, needing to bet with increasing amounts of money, gambling to escape, trying to win back lost money, and lying to family members about gambling. People with at least five of these attributes are diagnosed as pathological gamblers, while those with fewer symptoms may be categorized as problem gamblers. The classification of pathological gambling is set to undergo a major shift with the publication of the DSM-5, currently scheduled for May. The DSM-5 no longer will classify pathological gambling as an impulse control disorder; instead, it will be classified as a behavioral addiction. In addition, the number of criteria necessary to diagnose a gambling disorder will be lowered from five to four, according to the Responsible Gambling Council. There are two types of gamblers. Action gamblers seek gambling for excitement and risk. They gravitate toward games of skill such as poker, blackjack, and craps. Escape gamblers use gambling to leave behind problems or worries. These players like games that rely more on luck than skill, including slot machines, bingo, and pull tabs. • Winning phase: A gambler finds betting to be fun and exciting, and sometimes wins a lot of money. • Losing phase: The person becomes preoccupied with gambling. Losses start to mount, forcing the individual to gamble more to recoup losses. • Desperation phase: The gambler’s obsession causes broken relationships and declining health. Although losses continue to mount, the gambler clings to the hope of winning a large sum of money. • Hopeless phase: The gambler no longer believes the losses can be surmounted. Many gamblers in this phase will commit illegal acts, and depression and suicide are risks. Warning signs of problem gambling generally fall into three groups: financial, behavioral, and emotional. Financial warning signs include gambling until cash is gone, leaving bills and debts unpaid, and borrowing from others or selling personal items to finance gambling. Behavioral warning signs include gambling alone, gambling for increasing amounts of time, and putting gambling before family, work, or school commitments. Emotional warning signs include a preoccupation with gambling, having to gamble more and more to feel the same “rush,” and using gambling to assuage anxiety and depression. One of the simplest yet most effective screening tools for problem gambling is the Lie/Bet tool. This two-question tool asks gamblers if they ever have felt the need to bet more and more money, and if they ever have lied to people important to them about the extent of their gambling. Anyone who answers yes to one or both of these questions should be referred for further assessment. Other measurement tools include the South Oaks Gambling Screen (SOGS), a 20-item scale for initial assessments, and Gamblers Anonymous’ 20 Questions, which asks about gambling behaviors. There also are instruments for particular populations; for example, the SOGS-RA is designed to be used with adolescents. Information about these and other screening tools is available at www.npgaw.org/tools/screeningtools.asp and www.gamblersanonymous.org/ga/content/20-questions. Boardman, B., & Perry, J. J. (2007). Access to gambling and declaring personal bankruptcy. The Journal of Socio-Economics, 36(5), 789-801. Marotta, J., Moore, T., & Christensen, T. (2011). 2010 national survey of publicly funded problem gambling services. Phoenix, AZ: Association of Problem Gambling Service Administrators. Rush, B. R., Veldhuizen, S., & Adlaf, E. M. (2007). Mapping the prevalence of problem gambling and its association with treatment accessibility and proximity to gambling venues. Journal of Gambling Issues, 20, 193-214. Sevigny, S., Ladouceur, R., Jacques, C., & Cantinotti, M. (2008). Links between casino proximity and gambling participation, expenditure and pathology. Psychology of Addictive Behaviors, 22(2), 295-301. Thomas, A. C., Bates, G., Moore, S., Kyrios, M., Meredyth, D., & Jessop, G. (2011). Gambling and the multidimensionality of accessibility: More than just proximity to venues. International Journal of Mental Health and Addiction, 9(1), 88-101.